What will happen in the final week of Brexit? There's a growing acceptance that the Brexit saga may go to the wire, but when push comes to shove, we suspect British MPs will be more inclined to support an Article 50 extension than PM May's deal. The problem is nobody knows for sure how long a delay might last - and will it just tee-up a new cliff edge in a few months time? With today's Brexit vote increasingly looking like a non-event, it’s hard to escape the feeling that the Brexit saga could stretch out until days, or maybe even hours, before the UK is due to leave on 29 March. In fact, media reports now suggest things might go as late as the EU Council meeting on 21 March before some kind of deal gets struck. With few signs of compromise on either side of the debate, it’s easy to see how this could end up being the case. As we discussed in our latest economic update, the EU has ruled out reopening negotiations on the main withdrawal agreement, not least because there are no guarantees any changes would make the crucial difference in gaining parliamentary support. It seems unlikely that the tables will turn imminently in favour of Mrs May’s deal or an alternative exit strategy. So what about an extension to the Article 50 negotiating period? Equally, there are few signs that Theresa May is prepared to seek cross-party consensus on an alternative proposal. That’s not to say this won’t be the way things go in the end, but for now, the Conservative leader is focusing on keeping her bitterly divided party held together. The odds of a second referendum also appear to have drifted lower. Labour leader Jeremy Corbyn remains reluctant to back one, not least because a number of Labour MPs represent leave-supporting areas. Put all of that together, and it seems unlikely that the tables will turn imminently in favour of Mrs May’s deal or an alternative exit strategy. So what about an extension to the Article 50 negotiating period? There’s little doubt now that more time will be needed to deliver Brexit – whatever happens between now and 29 March. The process of translating existing EU rules into the UK rulebook still has a long way to go, although there is talk that much of this could be rushed through at the last minute with rarely used, emergency processes. As we noted earlier in the year, orchestrating alternative Brexit options (second referendum, different deal etc.) could take much longer still. But while a delay appears increasingly inevitable, some lawmakers are reluctant to back this strategy just yet. A plan, tabled by MP Yvette Cooper and Nick Boles that laid the groundwork for an Article 50 extension, was rejected by MPs at the end of January. Two weeks on, and the plan’s authors have decided to save a repeat fight until later to try and yield greater success. One thing we do know though is that a majority of lawmakers are against the idea of ‘no deal’. So when push comes to shove, and barring any accidents, MPs will ultimately have to choose between the deal and a Brexit delay (or both). So how will the situation look on 21 March as EU leaders meet for their final gathering before Brexit? The first thing to note is that the economic backdrop could be rapidly deteriorating. In practical terms, a lack of agreement would mean business would be planning their operations for the next week with no idea the trading terms they’ll be dealing with. One symptom of this is that it may become increasingly difficult to arrange cross-border shipments. According to the supply chain publication Loadstar, 85% of the lorries that operate on the major Dover-Calais shipping route are EU-based. Given that there is a real risk of lorries getting stuck in the UK in the event of no-deal, there’s very limited incentive for these haulage firms to take UK-bound jobs in days running up to 29 March. That’s just one specific example, but more broadly firms are likely to take an increasingly cautious stance as the exit date draws nearer. Consumers too may become increasingly wary. With one week to go, there is a clear possibility that a stockpiling mentality begins to take hold. The example of 2012, where fears of a fuel shortage saw long queues formed at petrol stations, has been cited as one scenario that may arise again. A growing sense of unease in the economy will place extra pressure on parliament to break the deadlock. 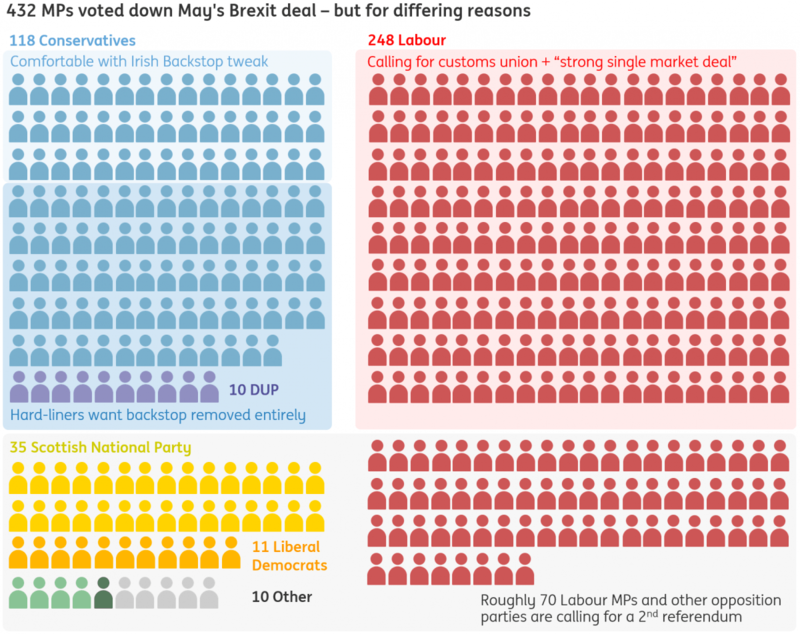 This may be enough to convince a few MPs to reluctantly back the deal at the last minute, although whether their numbers will be enough depends a lot on how the final deal looks after the 21 March EU Council. In reality, it’s unlikely to look much different than it does now. Probably the best the UK side could hope for is a legally-binding codicil, a well-worn crisis mechanism, to give assurances that the contentious Irish backstop will not last forever. This may be enough to change the minds of some Conservative MPs who voted down the deal in January. But many other hard-liners have indicated they will only support the agreement if the Irish backstop is removed entirely, and given that many of these MPs are more relaxed about the risk of ‘no deal’, it’s hard to know whether they would be persuaded to back down at the last minute. Either way, we suspect MPs would be more prepared to get behind extending Article 50 than they would be to back the deal at the last minute. After all, the original Cooper amendment, which aimed to give lawmakers a vote on extending Article 50 if the government failed to get its Brexit deal approved by the end of February, was defeated by a relatively narrow margin. At the time, it was also reported that a number of Conservative lawmakers were persuaded to reject the proposal, on the promise that they'd get another opportunity to make their feelings known on 14 February if no further progress was made. While the MPs driving this plan have opted against pushing it again this week, they've made it clear they will try to hold a vote on extending Article 50 on 27 February. Whether or not this will yield greater success is not clear - loyal Conservative MPs and ministers may again be convinced to stand behind the Prime Minister for a little while longer. But either way, we assume that as the Brexit deadline creeps nearer, the more moderate lawmakers will begin to lose patience and there is a strong likelihood parliament will try to force the government into applying for extra time. How long might a Brexit delay last? Nobody can really agree on how long an Article 50 extension might last. A lot depends on EU leaders, who don't forget, need to agree to any Article 50 extension unanimously. There is a consensus now that EU leaders would be prepared to accept a delay (although if all of this happens at the last minute, there's nothing to stop certain member states trying to extract concessions out of the UK). But there is a big logistical challenge in the form of the European parliamentary elections scheduled for May, which the UK is not due to take part in. It's worth remembering too that this year is a big one for Brussels, with a number of EU positions due to be filled and the next budget set to be finalised. Leaders will be reluctant to let Brexit distract from that. With that in mind, the path of least resistance may be to opt for a shorter extension - perhaps up to two/three months. This would avoid the need to hold elections, and maybe more palatable to the UK government. That said, a much longer extension - perhaps lasting to the end of the year- has also been mooted in the past to allow a more realistic timeframe for the situation to be resolved. However long a delay might last though, it doesn't remove the fact that Parliament will have to make up its mind on the deal in the end. This means that the risk of a 'no deal' will not go away forever, and as time goes on, there is a risk that Brussels begins to lose patience. However, we still think the likelihood of either the current deal or one that is adapted based on cross-party discussions, will ultimately prevail - be it before March or later on. Read the original article: What will happen in the final week of Brexit?